Dr. Oz had a great episode July 29, 2014, talking about issues ranging from ways to cheat on your diet in a healthy way, the best teas for weight loss, ways to save money on cosmetics, summer hair disasters, and Debbie Matenopoulos’s Greek cuisine recipes. Check it all out below! 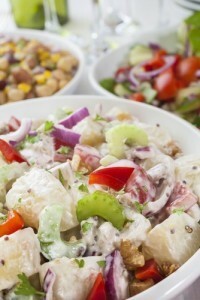 Dr. Oz shared his recipe for healthier potato salad, which swaps out mayo for Greek yogurt and Dijon mustard. Plus, he talked about the benefits of coconut ice cream. Dr. Oz shared his recipe for delicious and healthy Mate Sun tea on the show today, as well as recommending tumeric tea, matcha with kiwi cubes, and white tea. Dr. Oz talked to beauty expert Andrea Robinson about the best beauty secrets, including looking past cosmetic buzzwords and the importance of foundation primer. Dr. Oz talked to Tabatha Coffey about the best ways to take care of our hair in the summer and addressed common summer hair issues like chlorine green and frizzy hair. Dr. Oz talked to Debbie Matenopoulos who whipped up a special Marinated Greek Lemon Chicken recipe on the show today. Debbie Matenopoulos came by Dr. Oz to show off her Greek Yogurt Spaghetti recipe.